Although some aspects of Chinese culture has been severely neglected and abused over the 20th century, other aspects remain eternal in Chinese society. One enduring trait is appreciation for traditional calligraphy. Jiang Jieshi, former President of the Republic of China: A quote used to describe the Huangpu Military Academy during the Republican Revolution years, “The blood of past martyrs allows idealism to flower”. “Encouraging workers working on the Tibet/Sichuan expressway”. I am confused. How does 国防 fit in there? I think it actually means work hard at securing the national defense of (western?) borders, possibly as in Aksai Chin or Trans-Karakoram Tract disputed with India. I like Jiang’s. I never be able to read Mao’s well. I’m too confused with Deng’s. The calligraphy dose not say anything about Sichuan/Tibet or India. This would stir up comments from people who are allergy of some words. If there was a story behind that I don’t know please don’t explain to me. Let’s just focus on the calligraphy. How is calligraphy related to orthography and semantics in Chinese writing system? In alphabetic based writing systems and languages not so much attention is given to calligraphy. More attention is given to sentence construction. Mao once had a vivid self-description. He said he was a monk under an umbrella with neither hair nor law. His penmanship is a very good presentation of his characteristic which did not bring any benefit to China and its people. Mao’s calligraphy is by far the best among the images above. 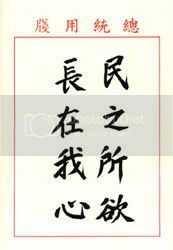 Here’s the calligraphy of the former President of the Republic of China, Chairman of the KMT, and spiritual leader of the Taiwan Solidarity Union, Lee Tenghui (the inscription reads “The people’s wishes remain in my heart”). 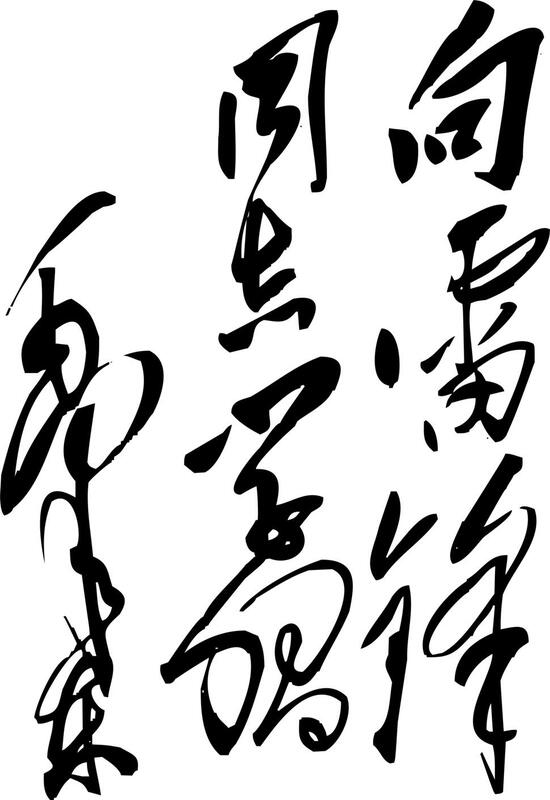 Anyone know where Hua Guofeng’s calligraphy can be found? 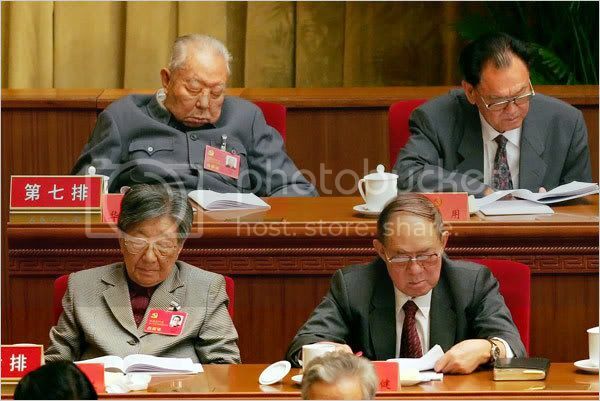 Nothing from Jiang Zemin? Outrageous. Thanks for the nice examples (in the post and comments). No time frame was given for this, but I assume it was written decades ago. Didn’t mean it to be political, just thought it was well done. And the highland charge like wax-hued elephants. Knew only shooting eagles, bow outstretched. Because Chinese (and especially Chinese poetry) is often expressed in a way that can only be understood and difficult to describe in words, and the format of Han characters themselves carry meaning… with traditional scholars, you can easily see the writer’s unique personality in their poetry and calligraphy. And the more sophisticated the work, the more difficult it is to get by with pretention. Calligraphy isn’t just meant to be aesthetically pleasing, what’s more important is what the author is attempting to express. Looking at the works from these modern figures, Mao Zedong is a true literary man. His calligraphy and poetry are far superior to the others, and makes obvious his nature of fiercely disdaining social rules. This is in stark contrast to the works of Jiang Jieshi, who’s written characters are straight and regular, as befitting his name “Zhongzheng” (central, regular). As far as the others who come after them, their works are no better than that of novices copying previous work, not worth mentioning. It could be that the difficulties to implement movable types had as result that calligraphy maintained its importance. But I still think there calligraphy is more important for Chinese characters. It seems to have a deeper influence on the meaning, not than merely decorative. About the difficulties about adapting CH characters to new technologies. I hear a story, not sure if its an Urban Legend ( Chinese character legend in this case). To transmit CH text by Morse with a telegraph two persons were needed at each end of the line. One to translate each character to a number and another to transmit that number by Morse. Same setup at the other end of the line, but in reverse way. Hope new technologies make things now much easier. You are clearly very informed on this topic, so thank you for being our teacher here. Are Hu Jintao and Wen Jiabao’s works really that amateurish? They looked “impressive”, but I am one of the uneducated… easily fooled on this. @Zuiweng – Saw the excerpts from that book, and the references to Hua Guofeng’s failed attempt to emulate Mao’s successes as a calligrapher, but no actual examples of the calligraphy of the leader everyone loves to forget. @ilikerice – “Study Leifeng”!?! But what do expect from the man who created the ‘three represents’. 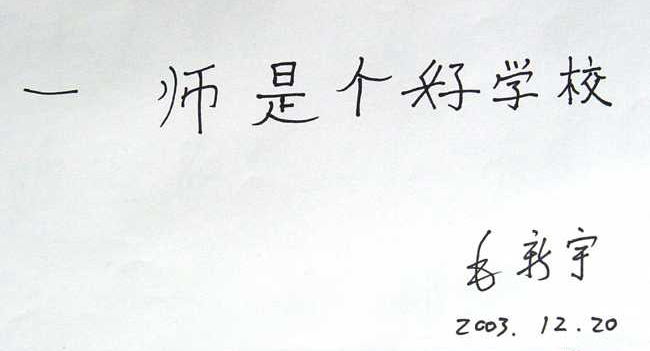 Jiang Zemin is actually very well-known for his calligraphy, mostly because he did so much of it. His writings grace newspapers, buildings from coast to coast in China… in the opinion of many though, he should be more humble, as his writing isn’t really that good. But definitely oversight on my part for leaving it out. My guess is that Deng Xiaoping simply wanted to avoid trying to write the complicated Chinese character for Tibet ( 西藏) in traditional calligraphy. It’s much easier to write 西陲! I completely agree with chorasmian’s comment. One’s calligraphy definitely reflects one’s personality. Mao’s calligraphy is one of a kind (i.e. original), just like the person himself. This is one of my favorite Mao’s poems. In this poem, Mao clearly sees himself above all those great historical figures. Mao is not only a great literary man, but also a great thinker and a military genius. Too bad he wasn’t very good at running a country, otherwise I would have agreed with him. But I have no doubt that if we give it some time, maybe 50 or 100 years from now, history will judge him as peer of Qin Shihuang, Tang Taizu, Song Taizu and Genghis Khan. A hero of his caliber is hard to come by even in China’s long history, after all, he unified a country and founded a new dynasty. I think we own westerners an explanation why lot of people in China still admire Mao. There is an overheated debate on MITBBS right now about Mao… both supporters and critics. I would love to do an article on it. Can you guys help me select a good example to translate? Wow! Very interesting! Too bad I’m uneducated like Buxi on Calligraphy. I heard people of my parents generation, now about 50-60 still studied and practiced writing Calligraphy when they were young. It’s too bad we dropped it now. I hope in future, they will reintroduce it back into education system. It’s such a valuable part of our culture, it would be a shame to see it became elite thing for a few. On regards of Mao, I understand AC’s statement about him. Of each famous figure in history, they all have some admirable aspects about them, whether or not their doing in the history was good or bad, or a mix. Mao, despite the disaster he cost the country, was a genius in many areas. His poems are greatly admired by the literary field, not because his doings, but the genius of the poems. I have little respect for what he did in later part of his life – Great Leap, Culture Revolution etc, but to judge fairly, there is no denying that he was talented in many fields. Have you guys watched the popular TV show about Mao Zedong and his classmates in their youth, when he was a college student at the teacher’s college in Hunan? Its called 恰同学少年. It’s only a TV show produced by the state media, so I’m sure it’s not completely accurate. It’s also been used as limited propaganda (which the script writer doesn’t approve of). But regardless, it’s a very interesting/cute look at contemporary China in Mao’s early years. Gives me another perspective on Mao. Thanks for your great translation. I think the comment “amateurish” is a bit too harsh on Hu and Wen’s works. Frankly, they are quite good by nowadays standard, but still far from can be proud of according to traditional standard. The level of 收放自如 (the pen becomes part of your body and you dong even feel it) is not easy to achieve. Perhaps because I like the style full of passion like Mao’s works, they are under marked in my eyes. My colleague’s insignia was handwritten Jiang Zeming, maybe because her wife graduated there too. I’d agree, “amateurish” isn’t quiet the word. It’s just, the writing isn’t alive. They haven’t owned and created their own style, installed their spirit and personality in their writing, but merely following the rules of the greatest before them. Would this be a better explanation? Hu ‘s writing is alive and has its own style, otherwise I will score it as amateurish. The problem is it doesn’t have enough confidence or energy to overcome the rules set by the greatest. Consequently, the diversity of strokes is compromised. This is a barrier preventing him from being a Calligraphy master. To be fair, given enough time and his pressure waived, especially from his current job, he may make it. @hotshotdebut – I wonder if Song Zuying has one. "You are quite Americanized." Chalk it up to the list of toxic exports from the U.S.